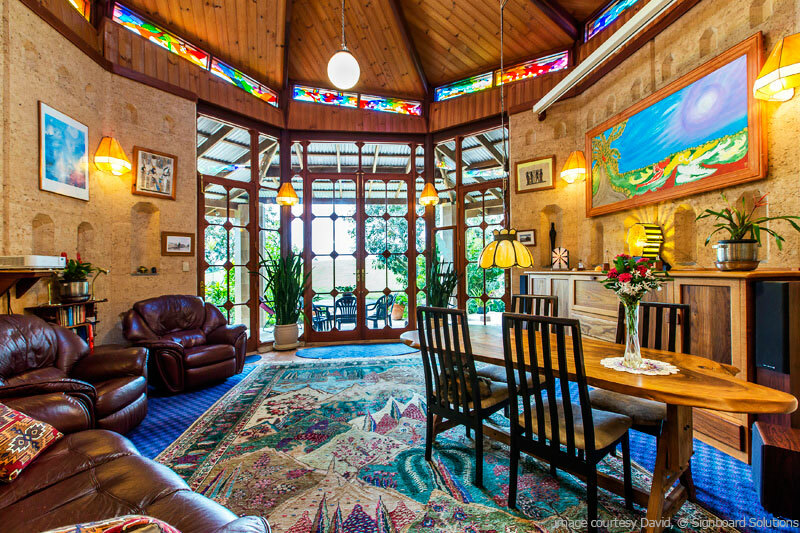 Our totally unique temple/home with separate studio, workshop and railway carriage guest accommodation nestle in seclusion on 5 lush flood-free acres 4 kilometres from the bustling township of Maleny in the Sunshine Coast Hinterland of Queensland. The first thing you will notice entering Middle Path is the profound peace and lack of stress which affects everyone who visits, along with the magnificent gardens and their cheerful ever-present flowers. This has been achieved, in part, by the pervasive influence of Feng Shui principles incorporated in the design of the main building with a focus on imbuing the structure with potent qualities of harmony and balance. The adjacent outbuildings (currently in use as a herbal pharmacy, a studio, a nursery and our workshop) can serve a multitude of purposes. The extensive irrigation we have installed throughout the property supports the abundant food, herb, medicine, fruit and vegetable gardens and the regenerating rainforest areas which, in turn, attract abundant wildlife. The large spring-fed lake surrounding our home provides an inexhaustible supply of top-quality water, constantly being replenished by 4 pollution-free aquifers. We operate a world wide Natural Health diagnosis and treatment business using the excellent ADSL2 bandwidth internet connection. Just over an hour’s drive to Brisbane International airport, 45 minutes to Sunshine Coast Airport, one hour to Noosa, and less than half an hour to the Sunshine Coast beaches, this is the perfect retreat to get away from it all without going to the ends of the earth. Our inspiring rural sanctuary offers a versatile and profoundly peaceful space to deflect the pressures of today's stressed world and regenerate your vitality surrounded by nature with the option of running a national or global operation. You can explore the property's features with the links on the buttons above or the text links below.